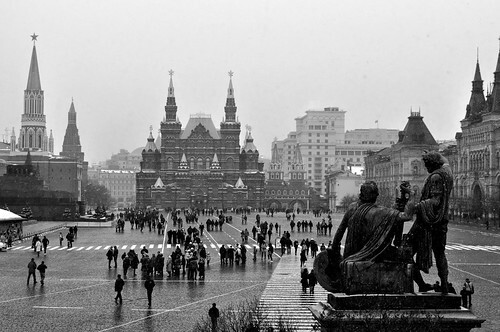 Visiting Moscow is like stepping into a history book from childhood, writes Sophie Williams. From navigating the depths of the city’s metro, to high tea with high society and exploring the Red Square, Moscow has all the elements of adventure – and attempting to get a grip on Cyrillic makes it just that more interesting! As the Aeroexpress speeds through Moscow’s suburbs, the snow falls at an alarming rate. Outside, people are padded with layers of clothing, attempting to get to work in conditions that I wouldn’t even take the bins out in. Stepping off the platform and into the station, you’re worlds away from the comfort of English-speakers, and into the unknown. Signs with incomprehensible Cyrillic letters give you the feeling you’ve stepped into another planet. Everything is new – but there’s something quite exciting about the culture shock. It’s best to get some grasp on the alphabet before you arrive in Moscow – especially if you want to use the Metro. Learn to recognise a couple of the useful signs – the ‘no entry’ sign is a good start! The stern guards hovering by the doors of the Metro’s entrance keep a watch out for people walking the wrong way – they’re not afraid to pull you aside and give you some choice words. The Moscow Metro is known around the world for its ornate, beautiful stations. When it opened in 1935 it was the first underground system in the Soviet Union. Arbatskaya station, in the centre of Moscow, is the deepest of them all – at 41 metres underground. Its high ceilings and ornate designs make it a great stop to jump off and take some photos. On weekdays, the Metro carries over seven million people – that’s double the number on the London Underground, and second only to Tokyo’s metro system. The trains are great for people watching – sit down and gaze at the different characters on board, from women in giant fur hats carrying designer bags, to those carrying their belongings in boxes and trolleys. 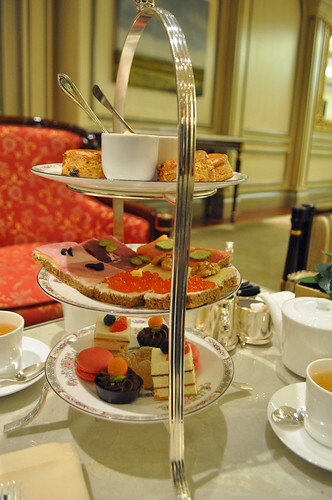 For a slice of Soviet elegance, head to the Ritz Carlton for afternoon tea. The foyer bar serves Moscow’s high society, including millionaires and TV personalities, and offers a fine choice of teas from Moroccan Mint to Asian Jasmine. Luckily, our waitress speaks perfect English and attends to our every need, straining our tea with gold-plated tea strainers. Sit back, relax, and tuck into scones with jam, or try Moscow’s specialty – caviar – while the man in a suit plays classical piano. The walls are decorated with artwork, vases and expensive cases of vintage whisky. Surrounded by so much opulence, we are surprised when we are handed the bill: a grand total of £50. I could get used to this! Afterwards we head to the Red Square, where you feel as though you are stepping right into one of those history books you read at school. The Kremlin and St Basil’s Cathedral looks exactly the same as I remembered from the black and white pages of text books. Inside the Cathedral, a large group of people have joined the Sunday service, and the melodic hymns fill the corridors. Surprisingly, the walls and roof are painted with brightly coloured flowers that resemble 60s wallpaper. The domes are strikingly high – and giant chandeliers hang from them, lighting the room. 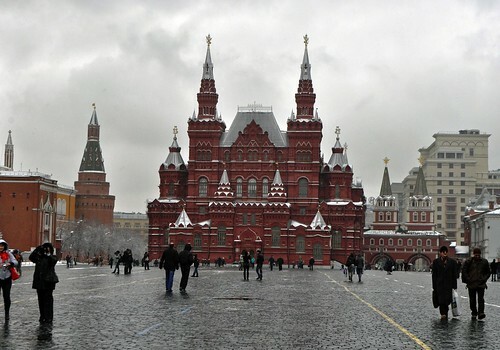 The famous Red Square is also host to Lenin’s Mausoleum. The death of the Marxist revolutionary sparked days of mourning and the government acted quickly to preserve his body for future generations. The tomb is open only between 10am and 1pm and there are always queues of curious tourists mixed with sombre Russians paying their respects. Inside, the tomb is almost pitch black, and the soldiers’ solemn stance is quite unnerving. A red spotlight lights up Lenin’s body in the glass case. Heading back towards the Kremlin, the tourist shops offer a sharp contrast to this sobering image. They are filled with a range of t-shirts with garish slogans (‘McLenin’, and the luminous pink ‘Moscow Nights’), Babushka dolls that fill the windows and a range of military hats by the counter. But this doesn’t stop me from picking up a souvenir or two! After what seems like no time at all, it’s time to leave. The metro seems less intimidating than before, and the signs are even beginning to make sense. The Aeroexpress speeds out through Moscow and into the suburbs – past wooden shacks with chimneys poking out of corrugated iron roofs. Soon the airport comes into sight and there are English signs and accents everywhere. The adventure has come to an end. Find out how you can have your own Moscow adventure with 3 nights and return airfares from £389. Give our consultants a call on 0208 045 4186 to book.